Could A Class 399 Tram-Train With Batteries Go Between Manchester Victoria And Rochdale/Bury Bolton Street/Rawtenstall Stations? In Rossendale Reopening Prospect, I looked at a proposal to run a new service between Manchester Victoria and Bury Bolton Street stations. Could this route be run by a Class 399 tram-train with a battery capability? These tram-trains would be very similar to the Stadler Citylink Metro Vehicles, that have been specified for the South Wales Metro. Wikipedia gives the weight of the vehicle as 66 tonnes. Bury has an altitude of 100 metres. Rochdale has an altitude of 137 metres. Rawtenstall has an altitude of 174 metres. I will assume 200 passengers at 90 Kg. each, which gives a weight of 12 tonnes. Using Omni’s Potential Energy Calculator gives the following. Manchester Victoria to Bury Bolton Street has an increase in potential energy of 12 kWh. Manchester Victoria to Rochdale has an increase in potential energy of 20 kWh. Manchester Victoria to Rawtenstall has an increase in potential energy of 28 kWh. When you consider that a Class 230 train has 400 kWh of batteries in a two-car train, I don’t think that there will be any problem fitting batteries big enough to take a Class 399 tram-train from Manchester Victoria to Bury Bolton Street, Rochdale or Rawstenstall stations under battery power with a full load of passengers. The batteries would be charged in Manchester Victoria station. Returning to Manchester Victoria station would use a small amount of battery power, with some assistance from Newton’s friend; gravity. The batteries would get a certain amount of charge from the regenerative braking of the tram-trains. 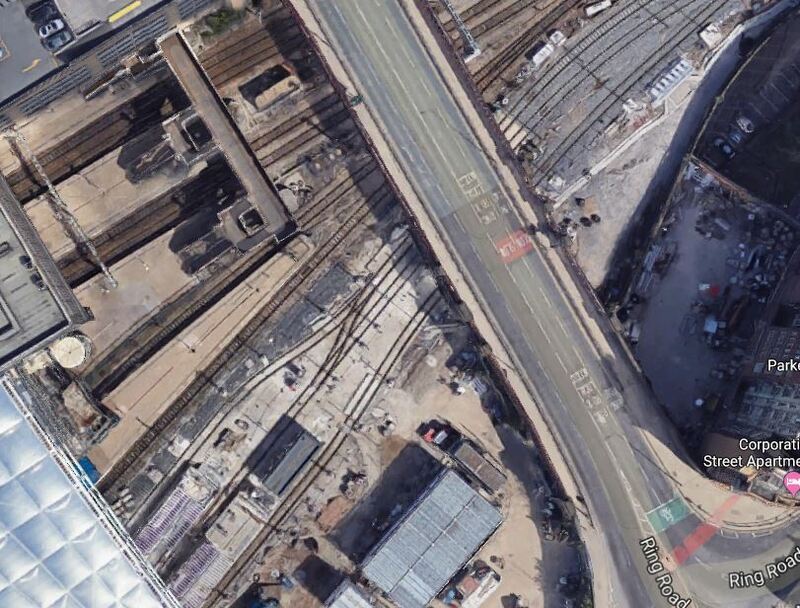 This Google Map shows the Eastern approaches into Manchester Victoria station. The four through platforms numbered 3 to 6. The two bay platforms numbered 1 and 2. The four platform faces and three tracks of the Metrolink. Having seen several tram-train systems all over Europe, I believe it would be possible to connect tram-trains running on batteries on the Calder Valley Line to the Manchester Metrolink at Manchester Victoria station. Going from Manchester to Bury Bolton Street, Rochdale or Rawtenstall, the tram-train would stop in the Manchester Victoria tram-stop, drop the pantograph and then continue on its way under battery power. Returning from the North, the tram-train would stop in the Manchester Victoria tram-stop, raise the pantograph and then continue on its way using power from the overhead wires. Batteries would be charged whilst running through Manchester. There couldn’t be too many tram-train systems that would be easier to build than this? It is interesting to note that Hebden Bridge station is just twenty-three miles from Manchester Victoria station and has an altitude of 190 metres. So would it be possible for a Class 399 tram-train to reach Hebden Bridge station on battery power? I very much think it would be! Class 156 trains are one of the better workhorses of the railways in the North and despite their age, they scrub up well. If their performance is compared to that of a Class 399 tram-train, they are not that different. Noise and vibration of the electric tram-train is obviously much lower. The modern interior of the tram-train is geared to the needs of passengers. Passenger capacity of the two vehicles is also about the same. In Karlsruhe, tram-trains travel for up to 100 miles from the centre of the city. Both Karlsruhe and Sheffield use three-car tram-trains, but Valencia uses much longer ones, so on heavily-used routes larger tram-trains could be used. I doubt there would be many complaints, if a Class 156 service were to be replaced with one run by Class 399 tram-trains. Electrifying the Calder Valley Line with 25 KVAC overhead wires as far as Rochdale station, would certainly make running to Hebden Bridge station possible. That electrification would also mean that electric trains could be turned-back at Rochdale station, just as diesel trains are now! I have flown my helicopter along the route and it looks like of the seven or eight bridges on the route, mostly appear to be modern structures for new roads or motorways. As 25 KVAC overhead electrification is currently being erected between Manchester Victoria and Stalybridge, a spur to Rochdale would be very much a simple addition. It could be a very useful short length of electrification. This article on Rail Technology Magazine was puiblished yesterday and is entitled Plans For Tram-Trains In Manchester Unveiled As Grayling And Burnham Mull Expansion Of Metrolink. Could we see tram-trains running from Bury Bolton Street, Hebden Bridge, Rawtenstall and Rochdale into Manchester Victoria and then taking to the existing tram network? If you’ve ever been to Karlsruhe, as I have to see the Class 399 tram-trains German cousins, you wouldn’t rule out anything. That would include tram-train services to Blackburn, Buxton, Chester, Glossop, Hebden Bridge, Sheffield, Southport and Wigan. Quite a serious oversight here. The line from Victoria to Bury is Metrolink and is already electrified (at 750v DC), so this part is easy. The line beyond Bury the East Lancashire Railway and would require electrification, battery or diesel power. I suppose the nostalgic might even propose steam. There is already a working connection between the two just south of Bury and an occasional connection between Metrolink and heavy rail near Victoria, so re dual the ELR section and new junction. The reconnection to Rochdale already has track on it and trains to Heywood, but at the Bury end a reversing motion would be required to go there from Manchester plus Rochdale already has trams and rail, so the financial case could be thin.